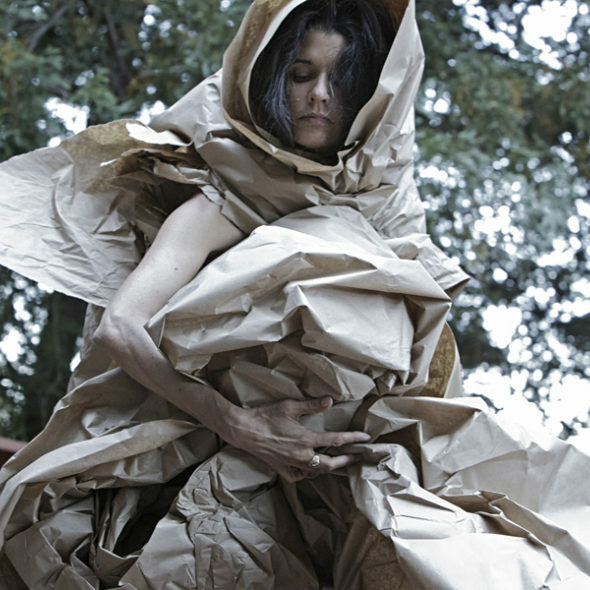 Artist Janine Antoni speaks of her recent engagement with dance and with choreographers, including Annie B, Parson, Jill Sigman, Stephen Petronio and Anna Halprin. 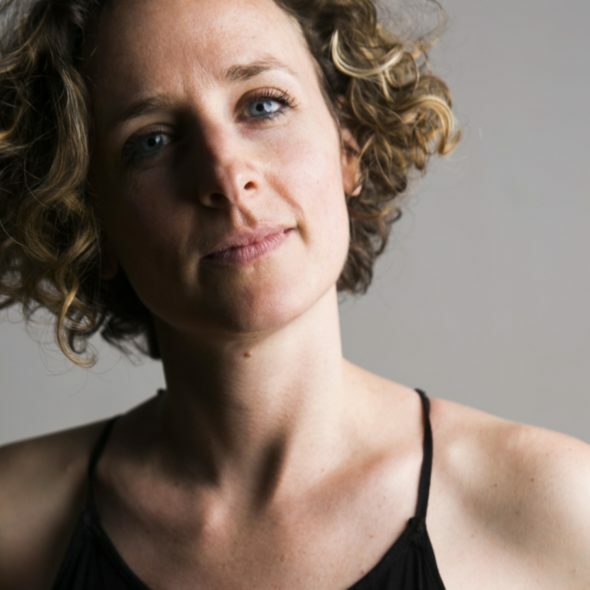 Antoni describes herself as new to dance, although her artistic practice has always centered on the body. Movement improvisation, she says, acts as an accelerator of her artistic process; when she dances, she can bring herself to a state of presence and creativity that she had usually had to wait to arrive in bursts between longer stretches of more intellectualized investigation. Antoni's work enacts a practical dialogue between bodies and objects and, by extension, between dance, sculpture and other visual art forms. Her works, as well as her discussion of them, intervene with a generous and probing spirit, in ongoing conversations about the interactions of these forms and disciplinary categories. Janine Antoni: So, when I was going around offering my studio, I ran into Annie B. Parson at a performance. I didn’t know who she was but learned quickly she was a choreographer. I told her about laying a dance floor in my studio, and she was immediately curious. I naively asked her if she needed a space to rehearse. She called me the next day and said, I want to come over and work on some duet material. Before her arrival, I made a Power Point on my work seen through the lens of the duet. I talked about the duet with 'the other,' the duet with my mother, and the duet with myself. After my presentation she turned to her dancers and said, ‘ok, shall we dance this?’ And I didn't know what to think. But, of course, knowing Annie B. now, it's exactly what she would do; she's pulling her sources from everywhere. Then Annie B. and I launched into a conversation about our husbands being artists while the dancers went off to create material from my slide lecture. And then about fifteen minutes later, they had material drawn from everything I showed them. I went for a walk with my husband [the artist Paul Ramirez Jonas] afterwards, and I said, kind of facetiously, this should be my retrospective. I had seen twenty-five years of my work performed in five minutes of dance. Abigail Levine: This was in what year? JA: This was in 2010. And he said, ‘that's a phenomenal idea.’ I said, ‘really?’ I was actually about to apply for the Guggenheim Fellowship and a Creative Capital Grant and this was the idea I had: to find five choreographers and ask them to choose a body of my work as a source from which to make a dance. I would call it a retrospective. It would replace the mid career survey show that is an idea that curators have been presenting to me. Frankly I'm completely terrified of looking backwards in that way. But a dance retrospective would be a way to move forward while looking back. I'd met Jill [Sigman] at a workshop I'd taught in London called Performance Matters. She's serious, and she's very interested in sculpture. And I said, let’s make a deal, I'll teach you what I know about sculpture if you teach me about dance. And she said ok, and she started to do things with me that became a piece. But what she said to me was, I'd be happy to do this with you, if I can do it on you. I had no idea what she was talking about “on me.” Actually, I was really offended by the term. AL: Welcome to being a dancer. JA: I know. ... I said you can do it with me. Or we can do it together, but what does this on thing mean? That misunderstanding basically generated the whole piece that we ended up doing together. It's called Wedge. ...The thing I should say is that rather than working directly with the content of my work, Jill did a lot of exercises to understand the feeling that I had while making the work. I wasn't sure exactly what it had to do with the work itself, but that was part of my journey. I tried to remain open to the way she was working even though I didn’t really understand how she was making meaning. It was so different than how I was used to communicating through my work. AL: Yes, explicit positioning of a work in relation to another is more present in visual art history than dance. Helicopter stretcher, polyurethane resin. Dimensions variable. JA: Also, our relationship to language as makers, and thinking before acting—all of this is different which has been interesting. I think part of the incredible, prolific moment that I'm having has to do with, in fact, letting go of a lot of those preconceptions. Working in dance has allowed me to think in another way. And then there is my experience of improvisation; I feel like it's not only changed my work, it's changed my personality. ...So, when Jill said, I'm going to make a piece on you, I said, ok, and I'm going to make a piece on you! We had the pottery wheel next to the dance floor, and I was making the hip bone pots. The wheel is a moving surface, and the forms are made because of the way the material is shaped by the body as the wheel moves. So, why can't I just apply that to Jill's moving body? As she danced, I tried to use her body to make something. I did what I always do—I used the body as a tool for making. I was on a crash course. Dance was slowly taking over my entire life. Jill Brienza invited me to a rehearsal of Stephen Petronio’s company. A week later he gave me a studio visit and asked me to make him a set for his upcoming performance, Like Lazarus Did. I had been looking at these objects called milagros. In many Latin American countries, when you have an ailment, you go and buy these wax body parts, you take them to the church, and they are hung on the ceiling as a prayer for healing. The thing that struck me about Stephen's work was how exuberant his choreography is. I would be taken away in the whirlwind of it all, and then I would leave the rehearsal with a simple gesture that kept haunting me. He has an extraordinary way of framing these provocative movements that seem to stick. Given the other work I was doing with somatic movement, I was really interested in how a gesture enters your body. For Like Lazarus Did, I decided to make Stephen a ‘living set’ of milagros. AL: What was your process of working with Stephen and the dancers? JA: I asked the dancers, of all the things you're doing in the dance, can you give me a gesture that resonates with you emotionally? They took pictures of themselves with their phones doing the movement and sent them to me. I took those gestures, and I reenacted them in my body to make casts from them. I said to him, “the only thing I can offer here is stillness.” So I took myself and my objects off the stage. I wanted to be a counterpoint to the movement. I started to become interested in the stillness of the audience, how their stillness provides the space for this kind of intense movement. I love the idea of mirror cells and that the audience is moving inside in response to what they are seeing while their exterior remains still. AL: Which is so hard sometimes. JA: Yes, I agree. I just went to see Steve Paxton at DIA, and I have never had to hold onto my body so tightly. I felt my vertebrae just popping. [Showing an image of Like Lazarus Did] This is what I made for him. I really wanted to equate myself with the stillness of the audience, so I hung my sculpture over the audience, and I hung under it remaining completely still for the duration of the performance. AL: And how did you come to work with Anna Halprin? JA: I had gone to Esalen to do a workshop with her but I was too in awe to introduce myself. I just did the workshop and then a year later, I decided to write her. I sent a thank you letter along with my catalogue and told her how much the workshop changed the way I think. Anna said, why didn't you introduce yourself? I know Loving Care. She said, if you're ever in San Francisco, come have lunch. So, I got myself to San Francisco to meet with her. And then we were applying for NYSCA, and we needed a choreographer to apply with. I said, I can't ask Anna. And my assistant said, she can only say no. So, I sent her a letter. I wrote, I don't know anything about the dance world; this may be totally inappropriate, but would you be interested in working together? I told her the idea of my dance retrospective and asked her if she would ever consider doing it. She said, come on over. She completely ignored my idea. She called me up, and she said, I have a great idea for you. I can give you the paper from Parades and Changes. JA: My jaw dropped. I could care less about the dance retrospective at this point. It was a privilege to be in dialogue with such a historically significant work. I worked with her on her deck for a week. I lived in her house, and we spent every minute together. On the first day, she gave me the paper, which was perfect, because it was material and I could treat it just like I do materials in the studio. I didn't have to worry about how I move. I just paid attention to the paper and let it direct me. She knew exactly what she was doing. AL: So, the whole of her structure was giving you the materials? JA: That was the crazy thing, especially from my naive point of view. She gave me the paper, and just said, ‘you may want to take your clothes off.’ And that was it, no instruction. Day one. We went down to the deck, and I had my roll of paper, and she's sitting there on the bleachers, and I start to interact with the paper. AL: What are the specifications of the paper? JA: Just a roll of brown paper, the kind used to ship a package in the mail. She had a huge roll. I'm sure she works with it all the time. So, we pulled a piece off the roll. And, then, I was waiting for instruction, but there was no instruction, so I just kept going. Stephen told me, you're working with a master, you go and do whatever she says. Don't even try to collaborate. This is the opportunity of a lifetime. So, ok, I went with the intention of doing whatever she told me, but she didn't tell me anything. ...So, no instruction is coming, and I'm working and working and working with the paper, maybe two hours. It got dark but I didn’t notice. And then I hear a quiet voice saying, ‘you can stop now.’ I guess she was just waiting for me to stop, and I was waiting for her to stop me. The next day, she called the Berkeley Museum and said, ‘we're coming up. Janine is here, and we're going to perform a dance at the museum.’ I said to her, ‘Anna, you can't do that.’ She replied, ‘yes, I can - this is what museums are for.’ It wasn't advertised. I just turned up and did it. There were five or six people that watched. JA: Terrible, it was terrible. Anna’s deck is magical. I thought I was just being sentimental and then I took Stephen Petronio and Adrian Heathfield out there, and we all agreed; it was the deck. Something happens on that deck. It gave me permission to use time in a different way. Not to mention all those feet that have danced on that wood. But as soon as I was done, she called up all her friends in Marin and said, ‘this artist is here, and you should really come see what we've been working on... and we'll have a potluck!’ So, seventy-five people showed up, and I performed for them. AL: She is just composing these experiences as she goes. JA: That's the crazy thing with Anna; everything is that open. Stephen was shocked. We went there to work, and whoever turned up, she put in the piece. So, it was the secretary, the Feldenkrais practitioner who came for breakfast, everyone. She ended up not leaving for the whole day. Tamalpa was doing a workshop, so at lunchtime Anna took the whole workshop and invited them to work with me and Stephen. AL: And it's a conception of dance, of the practice, the ongoing exploration, being as important, or more important, than the finished artwork. JA: When we were there, Stephen wanted to come away with a score. He wanted to know what are we doing? And the very last time we did it, and we knew we were about to leave, she kept opening it and opening it. And then she said goodbye. And we were wondering, well, what do we work on? And she said, ‘oh, send me some videos.’ I wondered if that is a position or an insight from being ninety-five. She is much more focused on the process than the outcome. AL: I don't know that she's ever been any different. JA: I don't know. Her work and her way of working was always radical. When I look back on my experience, working with Anna is about entering into a philosophy. Anna has taught for her whole life. Learning from her is much deeper than getting instruction. Comparison of Gian Lorenzo Bernini "Ecstasy of Saint Teresa" and Janine Antoni in collaboration with Anna Halprin "Paper Dance" (2013). AL: So, then, do you feel any allegiance to stay faithful to anything from the work with Anna, or do you now go and just make something from that experience? JA: It's interesting because I didn't realize the freedom I was taking until I saw the way that Stephen has been handling the way we work with Anna. I feel like there's room to make decisions, and we have to make decisions about how to take what Anna made and re-site it in the gallery context, which is very specific. Of course, the decisions we make will be, hopefully, in line with what Anna has created. But I also feel a certain responsibility to it... I mean, she's asked me to put it in a gallery. She knows what that means. But solutions that work in a dance context with a dance audience don’t always work in a gallery. JA: Well, with Anna, one needs to consider her relationship to scoring and community rituals like the Planetary Dance. The score is a set of visual and verbal instructions. In the gallery or museum, you don't have that. I mean, there's participation, but it's always a concession to have to tell people what to do. The work should create a response that is meaningful in terms of their interaction with it. But you have to give them autonomy to make those decisions. And whatever decision they make creates the meaning, and should be embraced. AL: Though there's so much explaining in visual art. JA: Right, but not explaining, as in what to do. In the art world there is the big explaining, which is more about contextualizing the work but not Anna’s form of explaining. Such as "let’s just put a score on the wall." JA: Yeah. So, for the upcoming exhibition, there are all these questions that are still in the air about how this translates into the gallery and what is the most interesting way to do that. There will be the performances, and then there will be the context created by the installation for those performances because something has to remain there for three months when the performance isn't happening. It won't be documentation in any straightforward way. AL: There will the space for three months and, then, you and Stephen together will create a performance work as an event in it? JA: So, Anna made a piece called “Rope Dance” for Stephen and me to perform, “Paper Dance” for me to perform and she gave her work, The Courtesan and the Crone to Stephen to perform. And then Stephen and I will make a work together. And all four of these pieces will have an installation for the duration of the show. And the thing I'm sure won't happen—one should never say that—is that it won't be straight up documentation of the performance. And it won't be performers doing the pieces the entire time. So, we are looking for some way to solve that problem: the duration of viewing an exhibition and a performance, and the physical space of viewing an exhibition and a performance. AL: Something that signals the performance's existence. JA: Right. There are many examples of artists dealing with performance and retrospection in the museum context. Having performed Marina [Abramovic]’s work in her retrospective at MoMA, you have experienced her decisions intimately. So I have been thinking about that in relationship to Xavier [Le Roy]. I'm looking at all those models really carefully. In order to get a new perspective on my past work, I have engaged not only another form (dance), but also the work of two other artists from that form (choreographers). AL: What is it about your work with dance and with choreographers that you feel is what you want to bring into a gallery space? JA: Well, if you think my work has always been in this terrain between object, performance, and relic, I've been exploring this territory for a long time. If I can take what I know from that exploration and apply it to the way dance is being seen, that may be the biggest contribution I actually have. ...But I'm talking like I know how to do this; I have no idea. AL: I do feel that things can hold bodies, that they can hold movement. JA: I think you're right. I feel like I've done that to some degree. Then there's the question: but is it an artwork? I'm making incredible forms with paper, but somehow that's not enough for me. The paper forms are not objects I would make to remain in the world. And I have certain requirements of objects I put in the world. And so I'm in a funny place. AL: That's interesting. So, you remove the body from that, and it doesn't stand? AL: But it's not a physical thing you stand behind as an art object? JA: What dance allows for is endless malleability. Creating a kind of life that is reinvented over and over again. To still dance is, actually, to lose that malleability. These seem like very provocative gestures [with the paper]. They feel more like drawings than sculpture – drawings that speak about process rather than autonomous objects. AL: And then it's a question of, if you're an object maker, but the interest is when they get activated as choreography or danced improvisation, does it have a weight as an intervention in dance history? And is that important in the context of a visual art exhibit? JA: Well, that's my big fear because I realize I come to it from the art side. People from the dance world are seeing something interesting that I almost can’t recognize myself. They seem to be fascinated by watching me in the process of making sculptural decisions and how the material is moving me—because it's telling me what I need to do to it. And then there's something else that has to do with some kind of movement that comes from an inner listening. Those two things combined seem to intrigue. AL: You are a strong performer. JA: I've performed very few times in my life. I mean, I perform things in order to make objects. When I moved Anna would say, “She is so innocent,” as if to say don’t touch her because she might lose this. And then there's Stephen who's completely aware of what he's doing. She puts us together and says, how's this ever going to work? They're moving from totally different places. JA: So, I call up a friend of mine, Chris Sollars when I was heading to the Berkeley Museum to do Paper Dance. He is an ex-student and a great artist. I ask him if he come by and photograph the performance for me? After I perform Paper Dance he says, funny thing about that dance, I saw every piece you've ever made in it. So I guess I have come full circle to the retrospective idea. It makes sense that if I'm improvising, all I have to pull from is my past work. And life. What I know to be true. [Shows a series of slides that have body postures in relation to the paper that very closely mimic images of Antoni in performance of other works.] This was pretty uncanny and it opened up a whole new way for me to think. I felt like if I did Paper Dance and had a retrospective at the same time that, then, the dance would become programming for the retrospective. So, I felt instinctively that I should hold back the work so that people would have to find the work in the dance. Or that the work would be in the dance, and whether people wanted to go there or not was up to them. AL: One thing that improvisers always struggle with is that you get to know your way of moving, your movement habits, so well. JA: Yes, Anna does not want me to repeat myself. And, of course, the dance has changed radically. I can count on the physical material to keep it fresh. I guess I have counted on that throughout my career. Material is unwieldy, and I am in an improvisational duet with the material. It is an endlessly surprising partner and it keeps me responding in the moment. AL: But the idea for your retrospective, that your body holds and performs your history of sculptural forms, is a really nice one. JA: And the question is: is there a way to do that without actually putting the work there? AL: Without also visualizing your history in objects? JA: Yes, I don't know how to do that, but I'd like to figure out how.